As Missionary Work of The Church of Jesus Christ of Latter-day Saints (Mormon Church) progresses, this page will record updates. 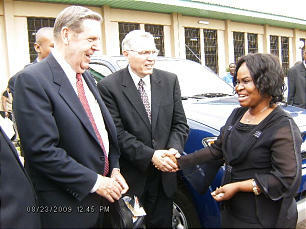 Elder Jeffrey R. Holland, left, Elder Paul Koelliker, center, greet Mayor Masini of Kinshasa, Democratic Republic of Congo. Photo courtesy Africa Southeast Area. In August of 2009 Elder Jeffrey R. Holland of the Quorum of the Twelve Apostles dedicated the countries of Cameroon and Rwanda for the preaching of the gospel. Elder Holland is the first known apostle to visit the two nations. Elder Holland's Africa trip took him to seven countries in all, with the other stops on his itinerary being Ethiopia, Democratic Republic of Congo, Kenya, Uganda and Zimbabwe. Elder Paul E. Koelliker of the Seventy and Africa Southeast Area president accompanied Elder Holland during his travels. Elder Holland dedicated the country of Cameroon on August 21, 2009, on a green hillside overlooking Cameroon's capital city of Yaounde in the company of local church leaders. Later in the day, approximately 600 people gathered to hear Elder Holland speak at Yaounde's City Center. 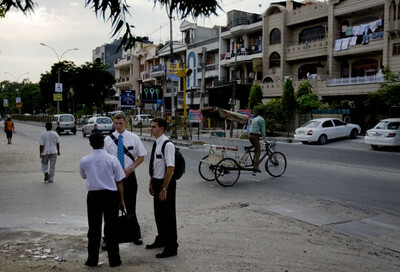 Mormon Missionaries in New Delhi, India. Mike Terry, Deseret News. Growth of the church in southern India was indicated by the formation of three new districts in the India Bangalore Mission on Sunday, October 11, 2009. They bring to five the total number of India districts in the Mormon mission, which also has a district on the island nation of Sri Lanka. India Bangalore Mission President Melvin R. Nichols conducted the organizing meeting that was broadcast via the Internet for viewing by members gathered in 14 meetinghouses in India and Sri Lanka. Elder Kent W. Watson of the Seventy, first counselor in the Asia Area presidency, oversaw the meeting linked by the Internet from Hong Kong. The meeting was attended by approximately 1,978 members, believed to be the largest gathering of Mormons in the history of The Church of Jesus Christ of Latter-day Saints in India. The three new districts are located in the cities of Coimbatore, Chennai, and Vishakhapatnam, key cities in the region. There are two branches in the Chennai District, four in the Coimbatore District and six in the Vishakhapatnam District. The two original districts -- Bangalore and Hyderabad -- were organized in the early 1990s and have four branches each. Total membership in the five districts is slightly more than 5,300. Gathered for the groundbreaking for the new Pakkret, Thailand, LDS meetinghouse are Bangkok Thailand Stake President Wisit Khanakham; Mr. Santi Chusri, Pakkret government officer; Thailand Bangkok Mission President Michael S. Smith; and Pakkret Thailand District President Surakkhaka Chaimongkon. 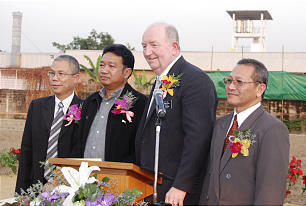 What will be the Church's largest meetinghouse in Thailand is under construction following a groundbreaking ceremony January 23, 2010. The new building is on a major high-profile boulevard in Moeng Than Thani, a suburb of Bangkok. The 16,350-square-foot building will accommodate three branches or wards with offices for the district presidency as well. The chapel will have the capacity for 230 people, increasing to 1,000 when opened up into the cultural hall. There will be 17 classrooms, and the building will be capable of housing a stake in the future. Besides a basketball court inside the building, there will be another outside on the grounds. Parking for 84 cars will be available. According to Rittrong Wangsuwan of the Church's Thailand Physical Facilities Department, Thailand has 19 Church-owned meetinghouses plus 18 rental buildings for 43 congregations. There is one stake and five districts. U.S. personnel U.S. set up "facilities, bases of operations, supply depots, transit facilities, R&R travel and leisure operations, hotels, and countless other needed goods and services. Each of these disciplines – and hundreds more – required highly specialized personnel, training, and support facilities of their own. This multiplied the 150,000 actual troops “in country” in Vietnam at any given time by ten fold. In total, more than 3,000,000 U.S. servicemen and women served in Vietnam from 1959 thru 1975." Some of these people were Latter-day Saints. As residents of Southeast Asia converted to the Church, they became future leaders, as their children became future missionaries. 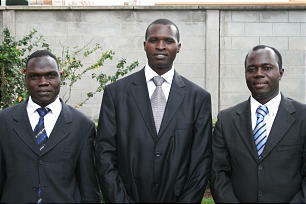 The first stake of The Church of Jesus Christ of Latter-day Saints in Uganda was organized on Sunday, January 17, 2010. Almost 1,000 members met at the Kololo meetinghouse in Kampala to sustain Jimmy Carter Okot as the new stake president, with Charles Ssekirangi and Jackson Isiko as his counselors. Giles Odongo was ordained as the Stake Patriarch, enabling local Latter-day Saints to receive patriarchal blessings without having to travel to Kenya. The organization of the stake in Uganda, the 25th stake in the Africa Southeast Area, had been long anticipated by the members, some of whom had been baptized in the mid-1990s. Uganda was assigned to the Kenya Nairobi Mission at its formation in 1991. Districts in Kampala and Jinja were organized in 1992. Missionary work has concentrated in those two areas, partly due to the more than three dozen languages found in the country. Uganda comes from a strong Christian culture and the people often express their faith in Jesus Christ. In 2005, the Uganda Kampala Mission was formed, which includes the countries of Uganda, Ethiopia, Rwanda and Southern Sudan. Keen interest in the doctrine of the Church and its humanitarian efforts in Uganda was evident in the questions that were asked by members of the press. Coverage of the conference was shown on television the next day. In February 2010 it was announced that to better align resources and adjust to the ever changing needs of the Church, 10 new missions will be organized in July, while 14 other missions will be combined with neighboring missions. The resulting number of missions will be 340. Pacific Area — Combine the Australia Sydney North Mission with the Australia Sydney South Mission. The resulting mission will be named the Australia Sydney Mission. Combine the Australia Melbourne West Mission with the Australia Melbourne East Mission. The resulting mission will be named the Australia Melbourne Mission. Africa Southeast Area — Create the Democratic Republic of Congo Lubumbashi Mission from a division of the Democratic Republic of Congo Kinshasa Mission. Europe Area — Combine the Germany Hamburg Mission with the Germany Berlin Mission, with headquarters in Berlin. Central America Area — Create the Guatemala Retalhuleu Mission from a division of the Guatemala Quetzaltenango and Guatemala Guatemala City Central missions. Create the Nicaragua Managua North Mission from a division of the Nicaragua Managua Mission. The name of the Nicaragua Managua Mission will be changed to the Nicaragua Managua South Mission. Caribbean Area — Combine the Puerto Rico San Juan East Mission with the Dominican Republic Santo Domingo East Mission, Puerto Rico San Juan West Mission, and the West Indies Mission. The name of the Puerto Rico San Juan West Mission will be changed to the Puerto Rico San Juan Mission. North America Central Area — Combine the Illinois Peoria Mission with the Iowa Des Moines, Missouri St. Louis and Nebraska Omaha missions. Combine the Illinois Chicago South Mission with the Illinois Chicago North Mission. The resulting mission will be named the Illinois Chicago Mission. Asia North Area — Combine the Korea Seoul West Mission with the Korea Seoul Mission. Combine the Japan Hiroshima Mission with the Japan Fukuoka and Japan Kobe missions. Mexico Area — Create the Mexico Mexico City Northwest Mission from a division of the Mexico Mexico City North and Mexico Mexico City West missions. Create the Mexico Villahermosa Mission from a division of the Mexico Tampico, Mexico Tuxtla Gutierrez and Mexico Veracruz missions. North America Northeast Area — Combine the New Jersey Cherry Hill Mission with the New Jersey Morristown and Pennsylvania Philadelphia missions. Combine the Ohio Cincinnati Mission with the Ohio Columbus and West Virginia Charleston missions. North America Southwest Area — Create the New Mexico Farmington Mission from a realignment of the Arizona Mesa, Arizona Phoenix, Arizona Tucson and New Mexico Albuquerque missions in the North America Southwest Area, and the Utah Provo Mission in the Utah South Area. Philippines Area — Create the Philippines Iloilo Mission from a division of the Philippines Bacolod Mission. South America Northwest Area — Create the Peru Cusco and Peru Lima West missions from a realignment of the Peru Arequipa, Peru Lima Central, Peru Lima East, Peru Lima North and Peru Lima South missions. Utah South Area — Create the Utah St. George Mission from a division of the Utah Provo Mission. The new Barrigada Guam Stake was created under the supervision of Mormon apostle L. Tom Perry during a conference held on December 12, 2010. The creation of the stake means that local members have progressed to the point that they can fill all positions of service in their local areas. The LDS Church has no paid clergy. It's up to the members to fill every position in their congregations. When local leadership has not come to fruition, or numbers of members are few, then the mission and missionaries fill the slots. Buildings were constructed where the Latter-day Saints could meet, but the Guam Branch was part of the Honolulu Hawaii Stake (1970). The Micronesia Guam Mission was created on April 1, 1980, and selections of the Book of Mormon have been translated into Chamorro. 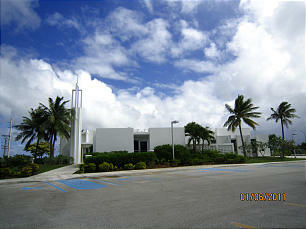 Church membership today in Guam and Saipan is about 2,000. Much of the growth has come from convert baptisms. This page was last edited on 27 June 2012, at 23:56.